For a better understanding of the subject matter, I have provided vivid images that accurately represent both types of dish. What is the Definition of an Offset Dish/Antenna? What is a Prime Focus Dish Antenna? According to Wikipedia, An offset dish antenna or off-axis dish antenna or Ku Band Dish is a type of parabolic antenna. 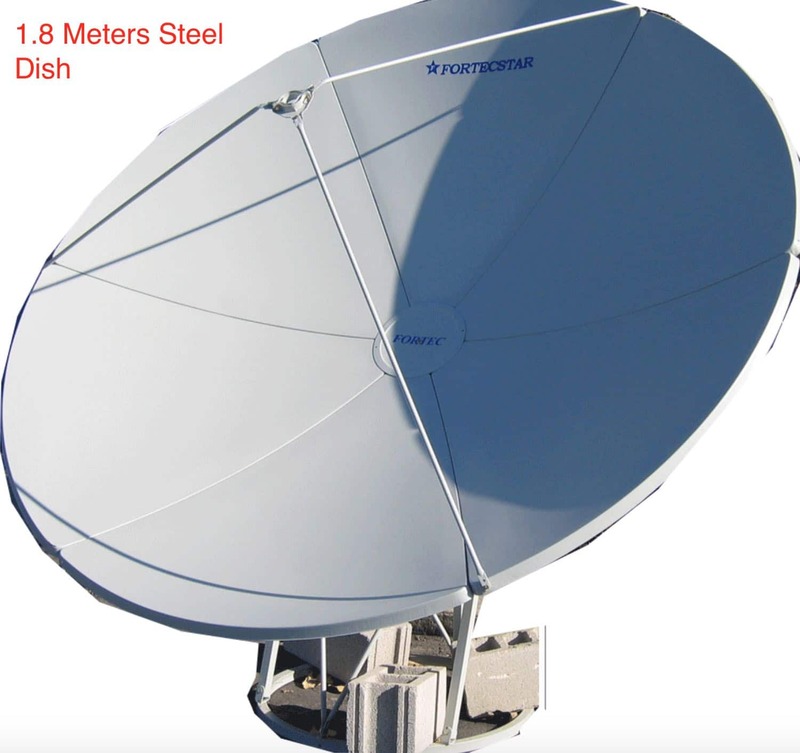 The reason we call is an offset dish because the antenna feed is offset to the side of the reflector, in contrast to the common “front-feed” parabolic antenna where the feed antenna is suspended in front of the dish, on its axis. As in a front-fed parabolic dish, the feed is located at the focal point of the reflector. So the focus is located to the side. Furthermore, An offset dish on the other hand just like the name suggests reflects the signals to an offset position usually around 20 degrees offset. The reflective area can be viewed as a parabola. 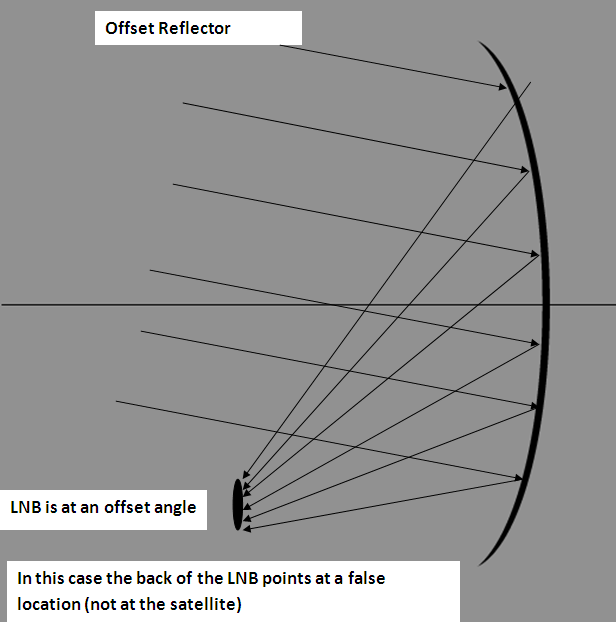 Furtherance to this, the back of the LNB on an offset dish usually points at a false location (not the satellite aimed by the dish). 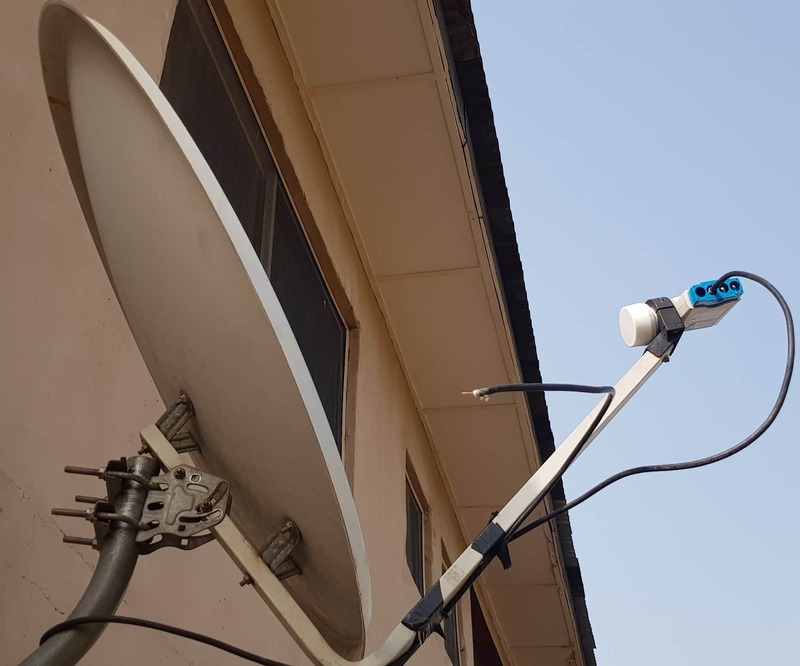 The LNBf and LNB holder of an offset dish do not in any way block the waves the dish is receiving unlike the LNB and LNB arms of a Prime focus dish. 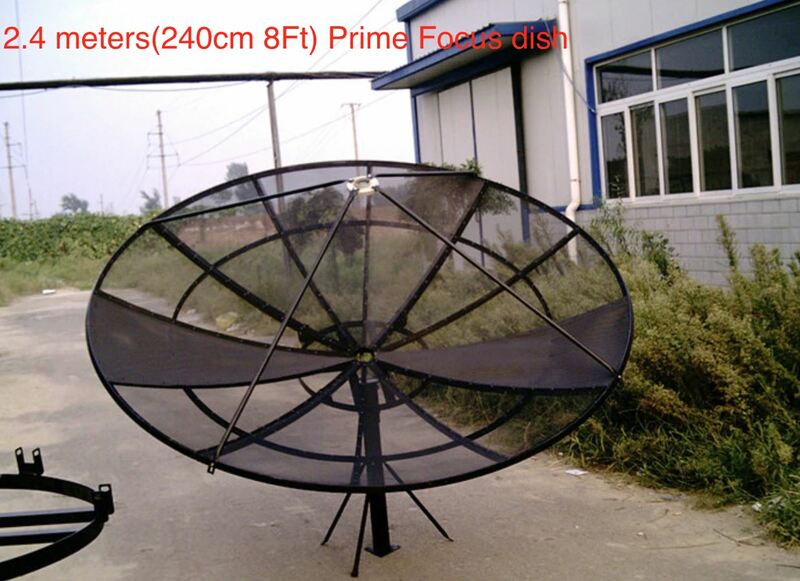 A Prime focus dish is a reflector whereby the waves received are concentrated on a central point in front of the dish. The prime focus is usually on the same plane as the most central point on the reflector itself. It can also be viewed as a concave reflector like the image above tries to explain. 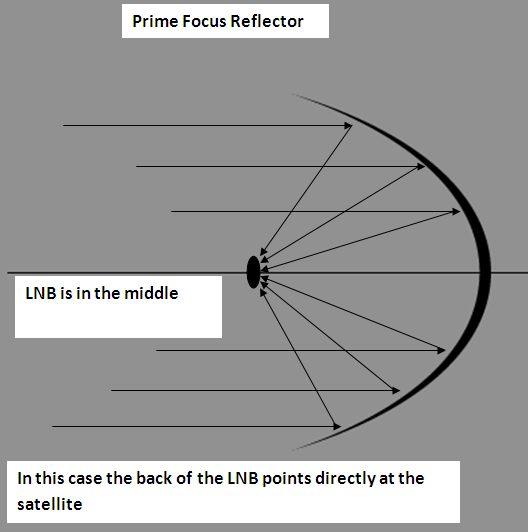 Summarily, prime focus dishes are dishes that support the LNB directly in the centre of the dish. This is commonly used on C band dishes. Now that we already have an idea of what an offset or a prime focus dish is, next is to pinpoint the differences between the two. To help us achieve this, take a look at the highlights below. To start with, Offset dishes are usually small in size and are used to receive Ku band waves. Most pay-TV/DirectTV providers will use an offset dish because it usually makes the equipment at the consumers’ end cheaper. For example, a small size 65cm offset dish usually goes for around #1,500 in Nigeria. Another difference which is an advantage of a prime focus dish is that the satellite elevation can be read directly off the dish with an inclinometer. There is nothing like a perforated offset dish like in the case of Prime focus mesh reflectors. Offset dishes have an advantage of being cheaper, lighter and can be installed almost anywhere. A prime focus dish is used to receive C band signals and is usually big in size. The smallest size C band/prime focus dish is around 1.2 meters(120cm) wide while an offset can be as small as 40cm. The LNB on a prime focus dish does slightly block the incoming signal from the satellite. Prime focus dish can either be polar mount or ground mount. You can’t mount it on a wall. An offset can be mount on a pole and on a wall. Also, prime focus reflectors are usually big and heavy and require a considerable amount of space to install them. Because of their big size, prime focus dishes are usually affected by the wind, that is why some dishes like the one in the image above are made of perforated metal or mesh. Another distinction is that you cannot receive Ku band waves with such a (mesh dish. This is because the Ku-band waves with their higher frequencies and shorter wavelengths will just penetrate the big holes and not be reflected at all. 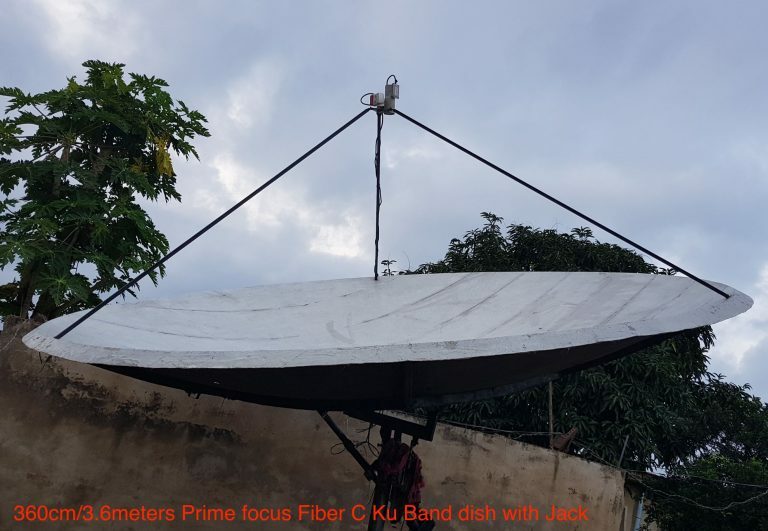 In other words, if you want both c band and Ku band signals on a prime focus dish, you need to get the one made of fibreglass or steel. For obvious reason, an offset/Ku band dish is the more popular of the two. 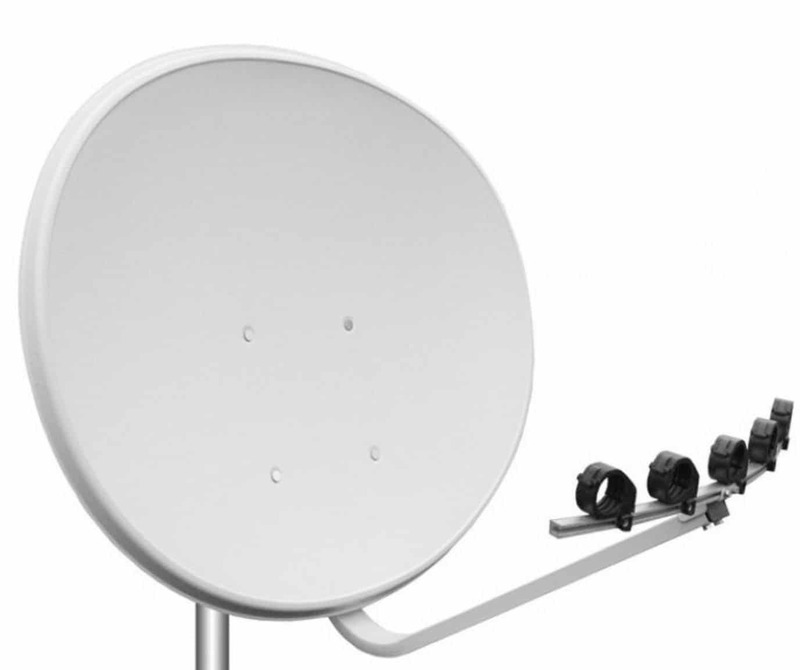 The materials used in building your prime focus dish can affect its signal reception quality. A steel dish or a fibre dish is the best in terms of signal. Interestingly, an offset dish as small as 90cm can use multiple LNBs to receive signals from multiple satellites. One of my pictures above already illustrated this. Similarly, you can combine a C band LNB and a Ku band LNB on a prime focus dish. This is possible as long as the dish is not made of Mesh. When your intention is Free-to-air channels, please go for a prime focus dish because it is capable of receiving more channels at once. The materials of some prime focus dish(e.g mesh or fibre) tend to degrade faster than the light material of an offset. if you replace the C Band LNB with a special type Ku band made for prime focus dishes then you can receive Ku band signals. Offset dishes are more commonly used on Ku band. The lnb is positioned on the arm lower than the central position of the dish. This means that if the dish is looking at an elevation of 60 degrees. That is, the dish itself will be pointing at a much lower angle than 60 degrees but the offset LNB will be looking at 60 degrees. Hello , why hotbird satellite signal drop in the evening time till morning especially on fiber dish? Am enjoying every thing here, thank you sir.